The genome data of mm9 should already be configured (How to configure genome data). RNA sequence: A file in FASTA format. For known lncRNAs, you can download their sequence from databases, such as UCSC Genome Table Browser. Gene list: A plain text file with one gene symbol (or Ensembl ID) per line. You may get them from your experiment or interested targets. FENDRR.fasta: RNA sequence of FENDRR in FASTA format. fendrr_gene_list.txt: A plain text file with differentially expressed gene names. fendrr_gene_list_ford_change.txt: A tab separated file containing gene name (first column) and absolute fold-change (second column) . The fold change information will be used as user provided experimental evidence to rank candidate target promoters. You can use the following command to see all the arguments related to promoter test. Given the example sequence and gene list, it is easy to perform the test with the default arguments. where -r is the lncRNA sequence, -de is the gene list, -rn is the name of the lncRNA, -organism defines the organism and -o is the path to output result files. Here, we use the gene list with fold change as example. 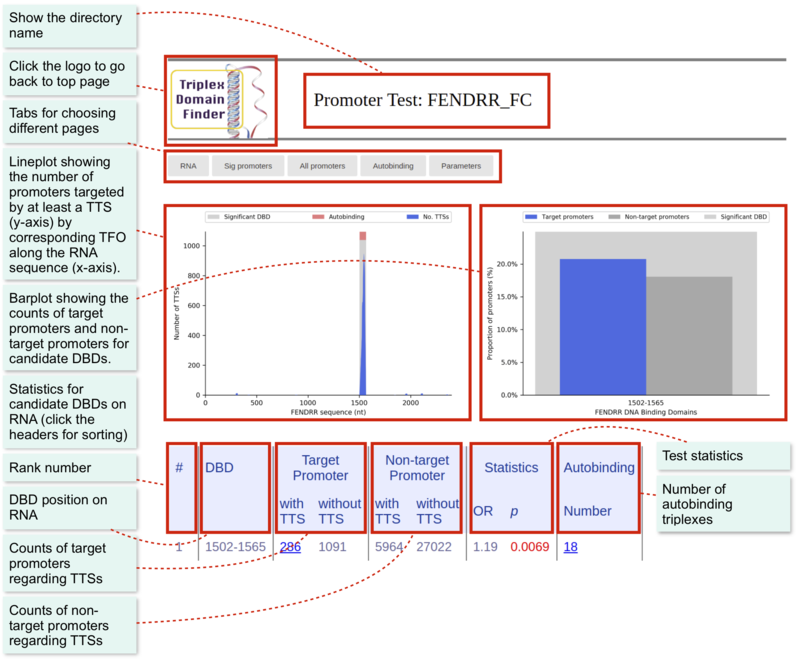 You can simply open promoter_test/FENDRR/index.html to see all the results and graphics (or see here an HTML output ). There are three main pages for each test. RNA page: Show statistics and graphics of candidate DBDs within the given RNA. Sig promoters: Show all the statistics of triplexes formed by the significant DBDs. All promoters: Show all the statistics of triplexes formed by the all DBDs. Autobinding: Show the statistics of autobinding triplexes. Parameters page: Show the parameters used by TDF. The main page is “RNA”, which will display main statistics regarding the candidate DBDs. You can see the Sig Promoters Page by selecting the corresponding tab. The page shows all target promoters ranked by a criteria of choice. Simply click at the header of each column to resort columns. We will describe a few relevant options of TDF. See the tool usage for a description of all options.